Download eBook Princess or Prisoner? 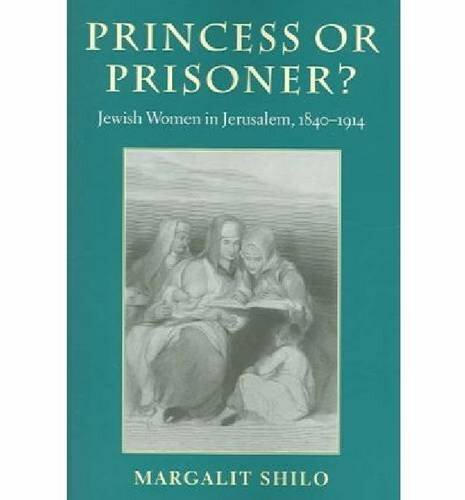 : Jewish Women in Jerusalem, 1840-1914 (The Tauber Institute Series for the Study of European Jewry & HBI Series on Jewish Women) by Margalit Shilo across multiple file-formats including EPUB, DOC, and PDF. This Princess or Prisoner? : Jewish Women in Jerusalem, 1840-1914 (The Tauber Institute Series for the Study of European Jewry & HBI Series on Jewish Women) book is not really ordinary book, you have it then the world is in your hands. The benefit you get by reading this book is actually information inside this reserve incredible fresh, you will get information which is getting deeper an individual read a lot of information you will get. This kind of Princess or Prisoner? : Jewish Women in Jerusalem, 1840-1914 (The Tauber Institute Series for the Study of European Jewry & HBI Series on Jewish Women) without we recognize teach the one who looking at it become critical in imagining and analyzing. Don’t be worry Princess or Prisoner? : Jewish Women in Jerusalem, 1840-1914 (The Tauber Institute Series for the Study of European Jewry & HBI Series on Jewish Women) can bring any time you are and not make your tote space or bookshelves’ grow to be full because you can have it inside your lovely laptop even cell phone. This Princess or Prisoner? : Jewish Women in Jerusalem, 1840-1914 (The Tauber Institute Series for the Study of European Jewry & HBI Series on Jewish Women) having great arrangement in word and layout, so you will not really feel uninterested in reading.